Mojo Wristbands come equipped with holographic technology, (in the form of discs). This technology has been used by elite athletes for years. Now, this technology is available for the rest of us! Mojo is not about wild claims of being a cure-all, the technology won't work for everyone, but there is plenty of feedback from people it has helped. 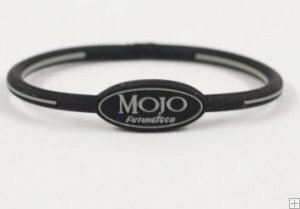 The benefit possibilities from wearing Mojo are endless because since no two bodies are alike, the benefits received are unique to each individual. Please be advised that 8" bands are usually suitable for larger wrists/males.